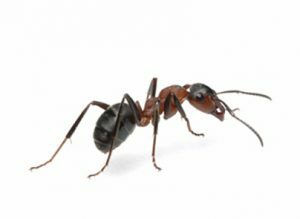 Carpenter Ants, large ants – 1/8″ – 1/2″ Color: Black with possible combinations of red and black or completely red or brown. 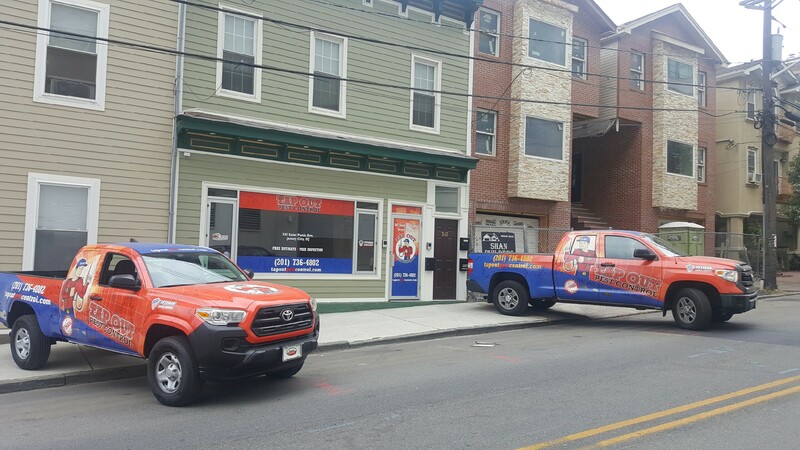 Wood destroying possibly causing structural damage. Reddish-brown. Adult bed bugs are about ¼ inch long, oval, and wingless. Their body is very flat, and they possess long, slender legs and antennae. They have a long, segmented proboscis (beak) that extends forward when the bug takes a blood meal. At rest, the proboscis lies beneath the body and projects backwards between the legs. Immature bed bugs are known either as “larvae” or “nymphs.” They closely resemble adults, but are smaller and less deeply pigmented. 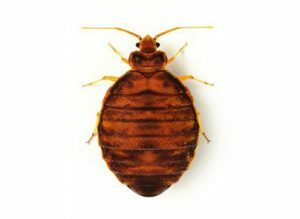 Bed bugs require blood in order to reproduce and complete their life cycle. The effect of bed bug bites varies among people, but they eventually produce red welts that itch. The bites themselves are not painful and typically are not felt. However, frequent feeding can disrupt people’s sleep and make them irritable, and seeing bites may cause emotional distress in some people. Bumble bees, carpenter bees, honey bees, hornets, and wasps. Carpenter bees and wood wasps bore into wood, potentially causing structural damage. 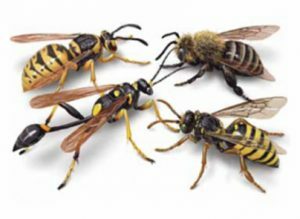 Yellow Jackets are far more aggressive and have painful, dangerous stings, especially if allergic. Light brown to tan; reddish brown. Oval in outline, body flattened, head partially or entirely concealed beneath prenatal shield. 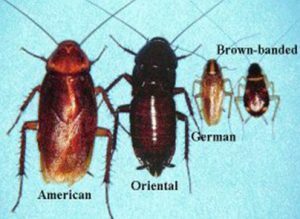 Common interior roaches – German, Brownbanded, Oriental, and American. Their presence is a nuisance but they are also known to be capable of carrying many common disease pathogens as well as causing allergic reactions. The house fly has a complete metamorphosis with distinct egg, larva or maggot, pupal and adult stages. 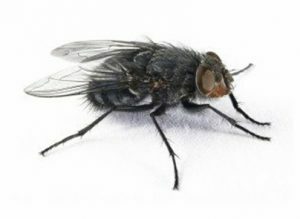 Warm summer conditions are generally optimum for the development of the house fly, and it can complete its life cycle in as little as seven to ten days. However, under suboptimal conditions the life cycle may require up to two months. Not only are house flies a nuisance, but they can also transport disease causing organisms. Excessive fly populations nearby human habitations can create a public health problem. Male mosquitoes have short mouth parts and feed on plant nectar. 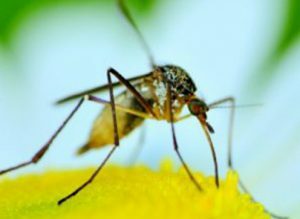 In contrast, female mosquitoes have a long proboscis that they use to bite animals and humans and feed on their blood (the blood provides proteins that the females need to lay eggs). After they feed, females lay their eggs. Females continue this cycle and live anywhere from many days to weeks (longer over the winter); males usually live only a few days after mating. Mosquitoes can be very annoying, their bites can produce itchy welts, and the bites of some species are painful to certain individuals. “Quality of life” can be reduced in areas with high numbers of biting mosquitoes. Mosquitoes also are vectors (transmitters) of several viruses that can cause severe disease and even death in humans, including West Nile Virus, St. Louis Encephalitis Virus, LaCrosse Encephalitis Virus, Eastern Equine Encephalitis Virus, and Western Equine Encephalitis Virus. There are over 3,200 species of mosquitoes in the world and 174 just in the United States? House Mouse is a small, slender rodent that has a slightly pointed nose; small, black, somewhat protruding eyes; large, scantily haired ears, and a nearly hairless tail with obvious scale rings. The adult mouse weighs about 2/5 to 4/5 ounces. They are generally grayish-brown with a gray or buff belly. Similar mice include the white-footed mice and jumping mice (which have a white belly), and harvest mice (which have grooved upper incisor teeth.) Norway rat is also called the brown rat, house rat, barn rat, sewer rat, gray rat, or wharf rat. The nose is blunt, the ears are small and close set; the tail is scaly, seminaked and shorter than the head and body combined. Adult Norway rats weigh an average of about 1 pound. Its fur is coarse and usually is brownish or reddish-gray above, and whitish-gray on the belly. Blackish individuals occur in some locations. 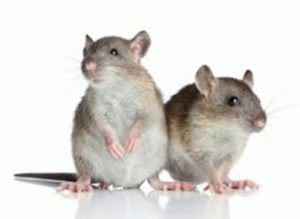 A very adaptable species, the house mouse and Norway rat often live in close association with humans and therefore are termed one of “commensal” rodents. 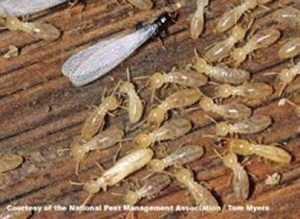 In addition to being nuisances, they can damage/destroy property, eat and contaminate food, and carry and transmit diseases. They also carry parasites such as fleas and ticks that carry diseases. A mouse can enter a building through a hole the size of a dime and rats the size of a quarter? Eastern Subterranean Swarmer – 3/8″ long including wings. Dark Brown to Black – Wings – translucent – appear silvery. Workers and soldiers – white, creamy color, generally stay in wood or mud tunnels. Wood destroying potentially causing great structural damage. Various sizes and shapes, depending on the type of tick and stage of life. 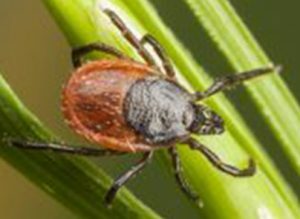 They are blood feeders and can transmit diseases such as Lyme disease, Rocky Mountain spotted fever, tularemia, and tick paralysis.